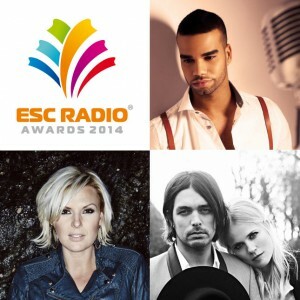 ESC Radio Awards 2014 – The Winners! András Kállay-Saunders, Hungary’s representative in Copenhagen scored the overall victory: His entry Running, written and composed by Krisztián Szakos and András himself, won the Best Song category with 8.8% of the vote, and he also tops the Best Male Artist (23.9%) after running neck-and-neck with Sebalter from Switzerland for the whole week. Congratulations to András Kállay-Saunders and the co-writer of his song, Krisztián Szakos. It’s the second time for Hungary to win in the ESC Radio Awards poll; in 2007 Magdi Rúzsa won the Best Female Artist award, placed second in the Best Song voting (Unsubstantial Blues). The second place in the Best Song category this year, with 8.5% of the vote, goes to Sweden’s Undo, co-written by Fredrik Kempe, David Kreuger and Hamed “K-One” Pirouzpanah, and performed by Sanna Nielsen, while Austria’s ESC winning song Rise Like A Phoenix (Charlie Mason, Joey Patulka, Ali Zuckowski, Julian Maas) finished in third place with 7.8%. Sanna Nielsen secured a clear win as Best Female Artist, with 30.1% of the vote. Second place goes to Conchita Wurst, 20.7% of the listeners voted for her, followed by Ukraine’s Mariya Yaremchuk in third place (13.1%). As mentioned earlier, the Best Male Artist voting saw a veritable neck-and neck race between András Kállay-Saunders and Sebalter. Only last night, during the last hours of the voting, András finally pulled ahead (23.9%), beating Sebalter to second place (23.2%). Aram Mp3 from Armenia finished in third place with 12.3% of the vote. 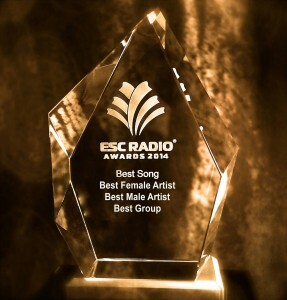 This entry was posted on Monday, May 26th, 2014 at 5:06 pm	and is filed under ESC Radio Awards. You can follow any responses to this entry through the RSS 2.0 feed. You can leave a response, or trackback from your own site. I’m so happy with the best song award and the best male artist award, because I love András Kallay Saunders and his song, Running. Besides, I love SeBalter too, as a matter of fact, I voted for them. On the other hand, I’m a little happy with the best group award, because the best group of Eurovision 2014 has the second place, “Freaky fortune and Riskky kid” #RIseUp ! Finally, I’m so annoyed with the best female award, I’m sorry for the rest of womens, but Ruth Lorenzo is the best female singer this year, it’s the reality. I’m so happy for Kallay Andras. He was amazing. he was my favourite for Best male artist. All my favourites won. Only for music. I was surprised that Conchita didn’t won best music award. The song and performance were outstanding, clearly the best this year. The dancers were amazing, too. Andras, your country and parents are very proud of you. I’m glad that Kallay Saunders won best song and best male artist – well deserved! Congrats to the other winners as well!